Power efficiency plus high-resolution graphics, thanks to the integrated Intel Celeron® Dual-Core SoC Processor J1800 with HD Graphics support. 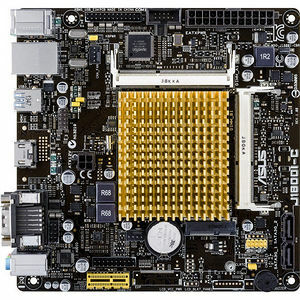 This motherboard features an integrated Intel Celeron® Dual-Core Processor J1800 and Intel HD Graphics. This revolutionary 22nm ultra low voltage SoC (System On a Chip) combines superb processing power and advanced HD graphics support in one small, energy efficient design. Despite minimal power requirements, it still has the processing power to display the latest DirectX® 11 HD graphics. It features support for dual independent displays with resolutions up to 2500x1600, and also has integrated USB 3.0 support.